To the uninformed and/or occasional viewer, Godzilla is simply Godzilla. The true G-fan, however, can discern which movie a given Godzilla belongs in by observing the features of the G-suit employed. This article will categorize and describe the many Godzilla suits. During the King of the Monster’s 40 year history, a new Godzilla costume would need to be built for each movie, or the most recent suit would be repaired and/or modified. It became a tradition at Toho that each Godzilla costume would have its own distinctive look. As Godzilla’s personality changed over the years, so did his physical appearance. For scenes that required water shots or extreme wear on the suit (such as pyrotechnics and fighting), the SPFX crew would usually employ an older, expendable Godzilla suit. Toho was also not reluctant to cut up their finely crafted Godzilla costumes for brief scenes. In the earlier films tight shots of small puppets, controlled either manually or electronically, were inter cut with shots of the actor in the Godzilla suit. An electronically controlled upper body with flexible facial expressions has been employed in the recent films. However, these articles will deal only with Godzilla suits, as well as any “stunt” suits and “half-suits” that appeared in certain scenes. The technical aspects of Godzilla suit construction will not be covered other than to say that prior to 1984, Godzilla suits were built using a “scratch-building” technique, i.e., no moulds were employed. The costumes were created by constructing a stuffed body suit covered with a latex skin to which Godzilla’s distinctive skin texture would be added. From 1984 onward, moulds were employed; various parts of the Godzilla suit were cast separately in latex and then assembled. The same body moulds have been used for all Godzilla suits since Godzilla 1985, and the same head mould since Godzilla vs Biollante. The differences in the newer costumes are due to the assembly process as well as the amount and shape of reinforcement in the suit. The practice of giving each of the various Godzilla costumes a nickname is fairly new, with the exceptions of “Kingoji” and “Mosugoji ” which originated in the 1980s. The use of nicknames apparently started with garage kit companies and was adopted in recent Godzilla digests. These nicknames are either a combination of part of the films’ title, such as Daisenso-Godzilla for the costume from Kaiju Daisenso (Monster Zero), or by combining the fIrst two syllables of “Gojira” with the fIrst two syllables of Godzilla’s opponent in a particular film, such as Kingoji for the costume from King Kong tai Godzilla (King Kong vs Godzilla). Thirteen main Godzilla suits were made between 1954 and 1994, numbered as Suit 1 to Suit 13. The Japanese also prefer to label the various Godzilla suits by year. 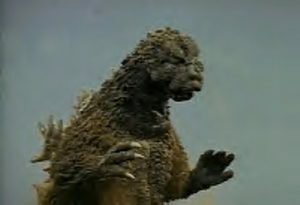 In some instances the same Godzilla costume would appear in a subsequent film with altered facial features, such as the Mosu(moth)goji and Megaro(Megalon)-Godzilla suits. In these cases, multiple TYPE years have been listed. The film(s) that each Godzilla costume “starred” in are listed under each suit entry. Although this article does not use a rating system to assess the aesthetic appeal of each Godzilla suit, it is noted which Godzilla suits are considered popular and not-so-popular. These comments are based on the annual fan polls, by observing which Godzilla styles are the most represented in the Japanese model kit market, and also on opinions expressed to the author by fellow writers and enthusiasts. 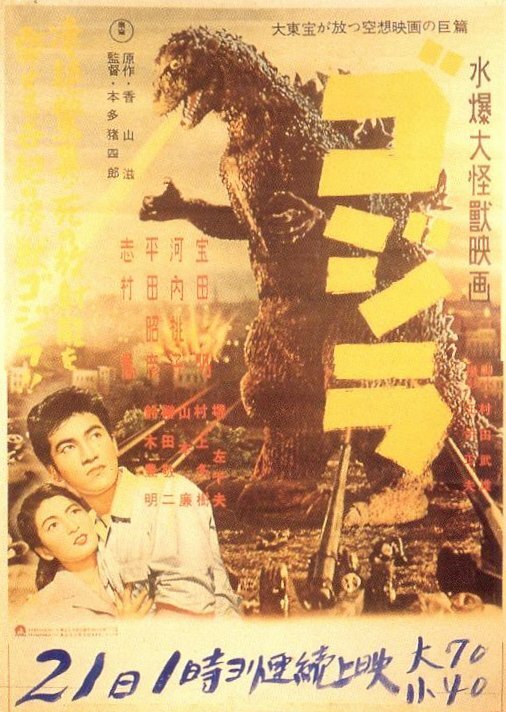 The Shodai-Godzilla is popular with fans who prefer the fIrst, serious tone Godzilla film. This suit featured a heavy lower body, small arms and a large, round head. The face had pronounced brows while the eyes were completely round with tiny pupils, a feature unique to this costume. The suit also included several features particular to itself and to the Gyakushu-Godzilla: fangs, four toes, a rough underside for the tail and pointed tail tip, and staggered rows of dorsal plates (these features would reappear with the “second” series of Godzilla films from 1984 to present). 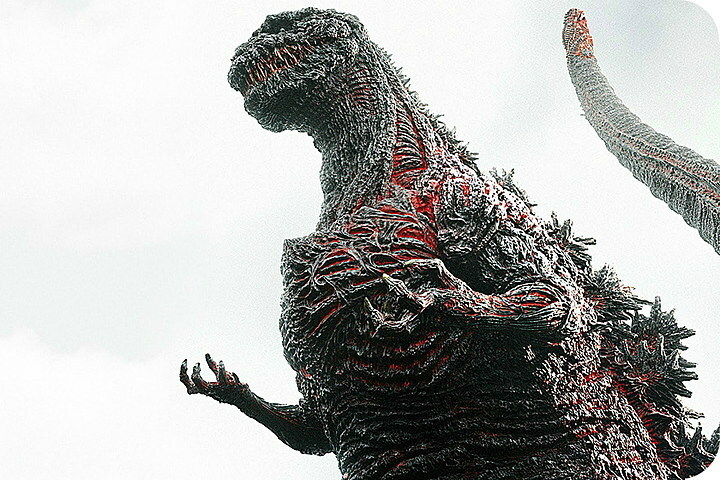 The dorsal plates for both the Shodai-Godzilla and the Gyakushu- Godzilla were dynamic in design and unique to the two costumes. During filming, a separate pair of Godzilla legs were used for close-up shots of Godzilla’s feet. The Gyakushu-Godzilla is generally overlooked by most Godzilla fans. Very similar to the Shodai-Godzilla, the Gyakushu-Godzilla was slimmer in build and had a smaller head. The lean look resulted from the need to make the suit more flexible to battle Angilas. 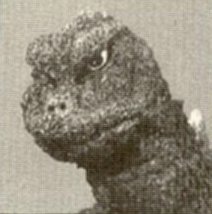 The Gyakushu-Godzilla also featured movable eyes. A separate set of legs, worn like boots, was used for close-ups of Godzilla’s feet. 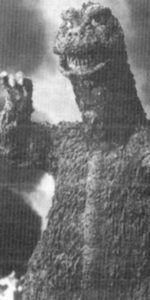 At the request of American International Pictures, Toho built new Godzilla and Angilas costumes for the proposed Americanization of Gigantis the Fire Monster, call “The Volcano Monsters” (see Godzilla In America: Gigantis). This suit is called Godzilla Type 1957. Since it never appeared in its own film, it will not be listed as a separate costume. However, several features of this suit, principally a thick stature and three toes (rather than four) influenced the design of the Kingoji seven years later. One of the most popular Godzilla designs, the Kingoji was radically different from any Godzilla suit before or since. The costume was more reptilian in appearance and the build was very stocky, especially in the lower half. The head was small and streamlined, with a strange combination of human-like eyes placed on the sides of the head in a reptilian manner. Other distinctive features for the Kingoji included large hands with spike-like claws and thumbs nearly as large as the three other fingers. The Kingoji also had several features that would be common to all Godzilla suits until the rebirth of the Godzilla series in 1984. These were a lack of ears, no fangs, three toes, smooth underside for the tail, and one main row of dorsal plates flanked by two small rows. The Kingoji was employed in Godzilla vs the Thing for a few brief scenes; two long shots (from behind) as Godzilla approaches Iwa island and when Godzilla, trapped in the silken web of the twin Mothra larvae, plunges into the ocean. 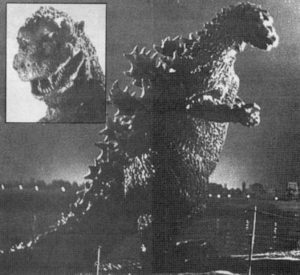 The Kingoji was also used in an obscure 8mm film titled “Legend of the Superbeast: Wolfman vs Godzilla”, which was apparently shot during the production of King Kong vs Godzilla. Widely regarded as the best Godzilla suit of all time, the Mosugoji was as different from the Kingoji as the Kingoji was from its two predecessors. The body of the Mosugoji was sleek and bell-shaped with a pronounced breast bone and knees. The hands featured slender, sharp claws with the fIngers held apart, which looked like they could tear the nicest high-rise OC apartments to ribbons. The dorsal plates were nearly identical to those of the Kingoji. The head was well proportioned to the body and the facial features were chillingly defind, with pronounced brows and splendidly evil eyes. For Ghidrah the Three Headed Monster, the Mosugoji costume was given different facial features. Movable eyes were inserted, the upper lip and teeth were reduced and the tongue elongated, going past the lower row of teeth. This modified costume is also called the SanDaiKaiju (Three Giant Monsters)-Godzilla. The Mosugoji costume was “disguised” and named Gomes for Ultra-Q episode #1, Gomes o Taose (“Defeat Games”) in 1966. 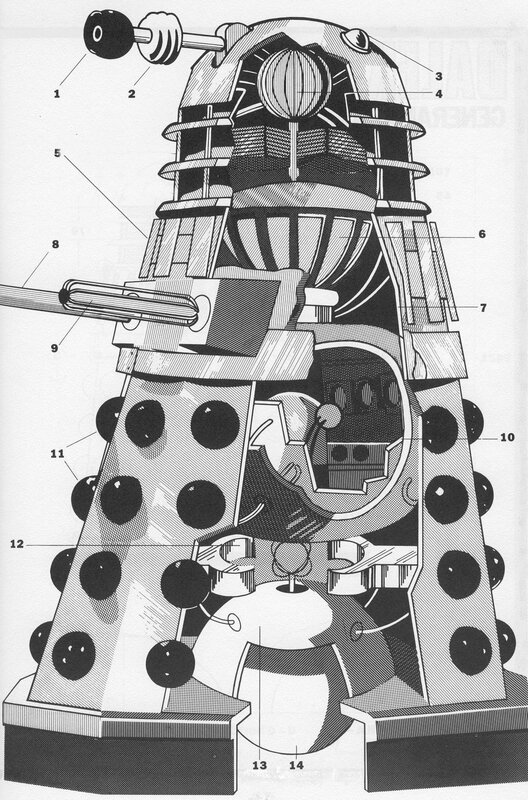 All of the armour plating and claws added to the Mosugoji suit to create Gomes were later removed with minor damage. Later in 1966, the Mosugoji was fitted with the head of the Daisenso-G odzilla (see next entry), repainted, equipped with an elaborate frill and named Jiras for Ultraman episode #10, “Secret of the Dinosaur Base” (see John Rocco Roberto’s “The Lost Godzilla Episodes,” for more details on Godzilla’s adventures on the small screen). Not as popular as its two predecessors, the Daisenso-Godzilla featured a head slightly larger than that of the Mosugoji, with a round face and jaws. The body was thin and had no defmed shape, appearing sack-like and unnatural. The fingers were not held apart like the Mosugoji but were grouped together, with the claws becoming less menacing; all following Godzilla suits until the 84 Godzilla would have this feature. On the plus side, the dorsal plates and the tail of the Daisenso-Godzilla were nicely detailed and the eyes were movable. The Daisenso-Godzilla was employed again for Godzilla vs the Sea Monster. The decapitated head (having previously been grafted to the Mosugoji) was given minor repairs and movable eyelids and was refitted to the original Daisenso-Godzilla body. This suit is also called the Nankai (South Seas)-Godzilla. Though the restored Daisenso-Godzilla was officially retired after Godzjlla vs the Sea Monster, the costume received a good workout as late as 1971, being employed for water shots in Son of Godzilla, Destroy All Monsters and in Godzilla vs the Smog Monster. In the latter fIlm, the suit was also used for the scene when Hedorah traps Godzilla in a ravine and tries to bury him with sludge. 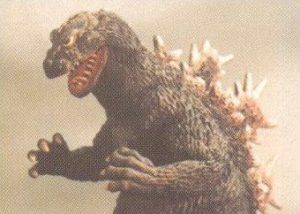 Unquestionably the ugliest Godzilla suit, the Musuko-Godzilla had a thick body, a fat neck, small hands and crude, odd-looking dorsal plates. The head was horrible, with a stubby face, oversized mouth with crude teeth and large, glassy eyes placed high on the head and at right angles. This suit was equipped with movable eyes and eyelids. 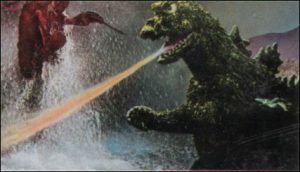 The Musuko-Godzilla would fortunately never again receive a starring role and appeared only once more, for water scenes in Godzilla on Monster Island. One of the more popular Godzilla designs, the Soshingeki-Godzilla featured a well proportioned, bell-shape body with a pronounced breast bone, a long neck and a head somewhat similar to the Daisenso-Godzilla, with defind brows and fairly menacing eyes. The eyes on this costume did not move, though the eyelids flutter briefly in the scene when King Ghidora flies overhead at Mt. Fuji. The Soshingeki-Godzilla had the most starring roles, though by counting “unofficial” water/stunt shots, the Daisenso-Godzilla appeared in more movies. Aside from slightly different brows, the Soshingeki-Godzilla was not changed in Godzilla’s Reve nge. In Godzilla vs the Smog Monster, the suit had rounded eyes, while the mouth had a frowning expression. In Godzilla on Monster Island, the suit had shaper eyes with movable eyelids. Unfortunately in the last two fihns, especially Godzilla on Monster Island, the Soshingeki-Godzilla was in an obviously dilapidated condition. For these three films, the Soshingeki-Godzilla has also been nicknamed All Kaiju (All Monsters)-Godzilla, Hedogoji and Gigan-Godzilla. 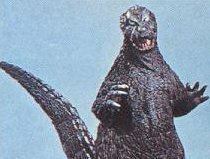 A strong contender with the Musuko-Godzilla for the Worst Godzilla Suit award, the Megaro-Godzilla had a plain, streamlined body, a short neck and fat, sinlply designed dorsal plates. The face was ghastly, with a sinlple muzzle, oversized brows and huge eyes that made the King of the Monsters resemble a puppy. 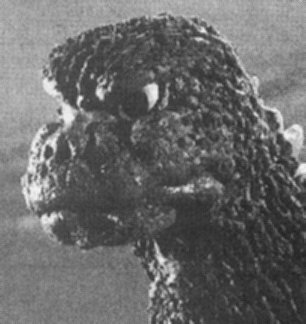 The eyes of the Megaro-Godzilla were movable and had movable eyelids. The Megaro-Godzilla also appeared in five of the 26 episodes of NTV’s Ryusei Ningen Zone (a.k.a. Zone Fighter) television series in 1973 (see “The Lost Godzilla Episodes”). 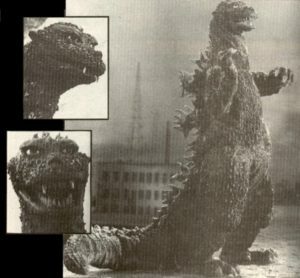 For Godzilla vs the Cosmic Monster, the Megaro-Godzilla was the same but with some changes to the face; more detail in the muzzle and reduction of the brows, making Godzilla look less playful than in the previous movie. The eyes did not move, nor have movable eyelids. This suit is also called the Mekagoji. 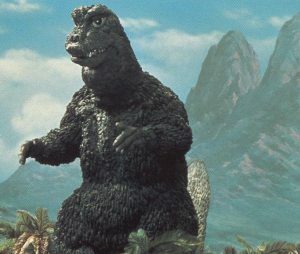 A second Godzilla costume, a publicity suit never intended for use in a feature movie, was also used in Cosmic Monster. The jaw and eyes were immobile, while the suit boasted a toothy grin complete with fangs. It was used when the disguised Mechagodzilla battles Angilas and during the clash with the real Godzilla at the oil refmery. It was also used for a special scene in the Japanese theatrical trailer for Cosmic Monster, when Godzilla is shown morphing into Mechagodzilla. This same “phony-Godzilla” costume was also employed for the fmal scene in The Terror of Mechagodzilla when Godzilla wades off into the ocean. Another publicity Godzilla suit (which appeared to be smiling) was employed in Cosmic Monster, in the scene when Godzilla appears in the ocean off Okinawa. For The Terror of Mechagodzilla, the Megaro-Godzilla received a further face lift; the muzzle was reduced and given more detail, the height of the brows lowered and the eyes reduced to an acceptable size. The new face thus had a semi- comical, semi-mean look. The eyes did not move nor have movable lids, and the body of the costume was unchanged. This suit is also called the Meka-Gyakshu-Godzilla.